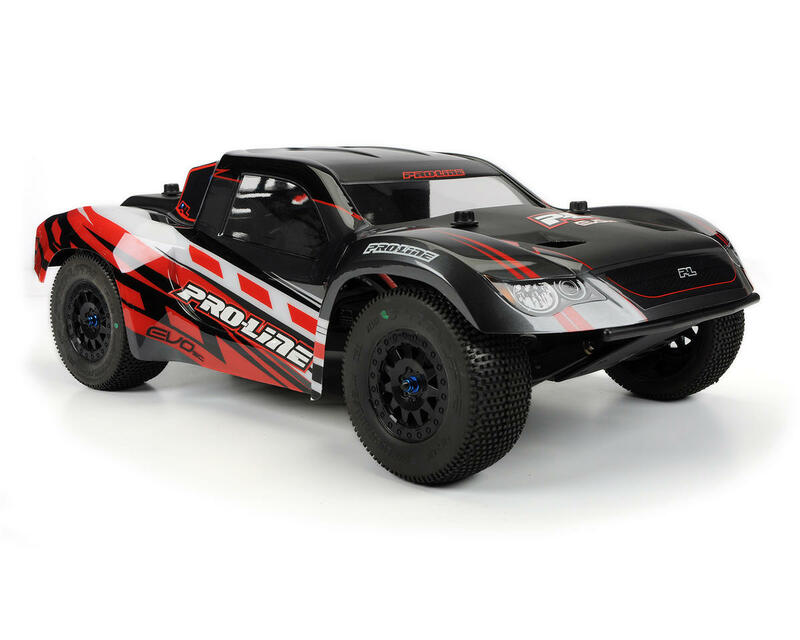 This is the Pro-Line EVO SC Body. After years of developing race winning bodies for Short Course trucks with advanced aerodynamic features, Pro-Line has unleashed the next Evolution of performance. The EVO SC body is designed with an aggressive sloped nose which keeps as much air as possible from getting under the hood; this decreases the dreaded parachute effect and gives you more control of your SC truck. The improved front down-force also enhances steering for quicker lap times. Pro-Line incorporated the maximum amount of vents possible in the rear of the body, in order to reduce drag, rear lift and weight as much as possible, while still maintaining long-lasting durability. All of these features add up to the most advanced Short Course Race Body ever constructed. Just used this body on my SCTE 2.0 for a long day of practice and full night of racing. Took some good spills and this body didn't crack at all. I just switched from using the JConcepts chevy 1500 body which started to crack after the first wreck. 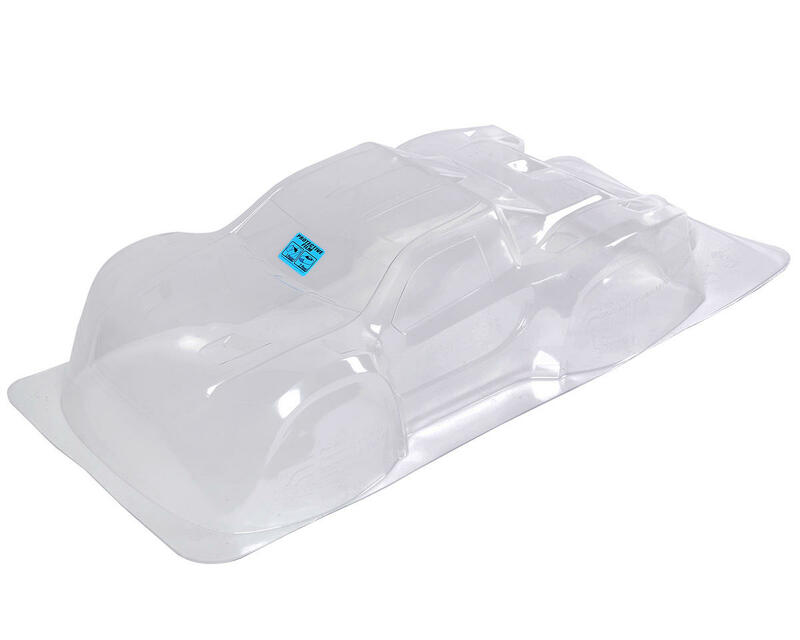 The material seems a little more flexible than the Losi or JConcepts body. It might feel flimsy but i think this is why this body doesn't crack as easily. It is kind of a pain in the rear to trim out off the cut out but there is not parachute effect at all with this body. Give this body a try, you won't be disappointed. Proline has done a good job on this new offering. The only down side is the numerous air-escape cut-outs. There are really too many choices and options. On the upside, there is no way this body will parachute if properly trimmed. This body fits the 22sct better than any body I have used to date--even the losi pre-cut body. I would buy this again and not attempt to cut-out all the air-escape vents next time. Bought this for my SCT410 and hated it the first time to the track. Went home put on the side air dams and cut out almost all the rear vents and now I really like this body, I like the compact design and also the whole nose down thing tends to be right on, true down the straights and can really get after it in the corners without the fear of traction roll,also flies true...no nose down. I like what the truck can do with this body. This body is durable. I have raced four weekends with it. Zero cracks. I had a mid-air collision, and it looked like someone took a golf club to the windshield/roof. A couple minutes later into the race, it had popped out on its own. Not a crease! I bought this body because I read these reviews. All of the comments, I agree with. My prior bodies had vents for parachuting, but it was irritating to have cracks after one night of racing. This is the best body I have ever owned. Tried Jconcepts.....paper thin. PROLINE Bodies are tough!!!! Super easy to paint, not a bunch awkward lines to mask and tape up. Easiest cutouts I have ever done. The looks of this body are second to none, not boxy. Sleek and flowing. Doesnt resemble any brand of truck, but short course isnt a scalers truck. Will buy again, and again........if it ever wears out!!!!!!! I've been through a lot of bodies over the years and most of them typically only last a few months. This one has lasted by far the longest of all of them. It may be a bit heavier then the SCTE 2.0 factory body which is very light, but you trade the light weight for a bit more durability. The gentle curves also help to keep it from cracking and tearing. I'm here to get another since my first one is getting pretty scarred up. but i would not try and use the "recommended" holes Pro Line tell you to use.